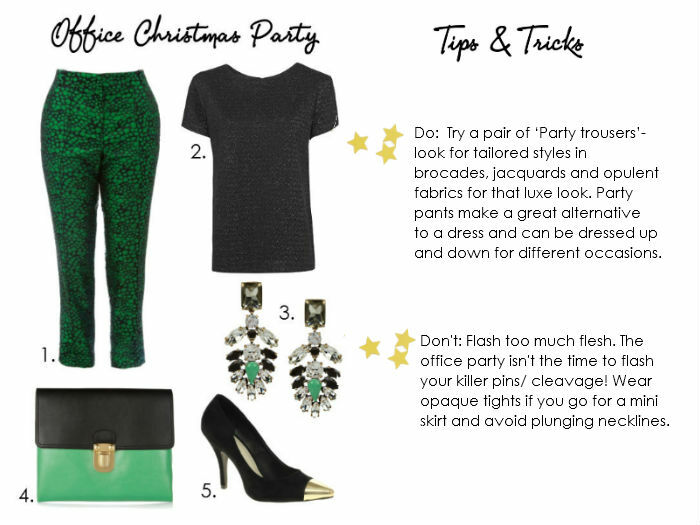 I've noticed my blog post on Christmas party outfits from last December has been getting quite a lot of traffic recently, so I decided it was about time I put together an updated post for 2012. Over the next few days I'll be sharing the looks I’d wear for those tricky sartorial occasions the festive season throws up- starting with the office Christmas party. 1. Spot Jacquard trousers, ASOS, £45. 2. Lurex Jacquard top, Mango, £34.99. 3. J.Crew Crystal encrusted earrings, Net-a-porter.com, £86. 4. Marni two-tone leather clutch, Net-a-porter.com, £280. 5. Metal toe detail heels, ASOS, £33.50. Oooh this is such a good blog idea post! I love this outfit. I really want to wear more fancy trousers when I go out! It's too cold outside for skirts now. Really love this whole outfit. The greenness of it is delic.